I know, when you think beauty blog you automatically think dental care, right?! Kidding. But really, I kind of love dental stuff- toothpaste, toothbrushes, floss... Dorky, perhaps, but most of us have teeth and spend a few moments a day tending to them. Day in day out. You might as well give your routine a little shake up every now and again, and maybe add in something a little more natural too. When I first started exploring the natural / organic dental care world, I didn't really think about changing my approach to toothbrushes. I mean, it makes sense that a non-plastic option, made from a renewable source is the better option for something you switch out twice a year (that adds up over a lifetime!) The Humble Brush is an easy way to lessen you environmental footprint, all while helping others in need. The bamboo handled toothbrush is naturally non-slip, and more impressively, 100% biodegradable. The bristles (available in black, white, yellow, blue, and pinky-purple) are made from BPA-free nylon-6, a material that also degrades over time, but it can also be processed through typical waste channels. The brush can be used for the average three months and is incredible comfortable, thanks to the curved handle and curve in the bristles that mimic the curve of your teeth. 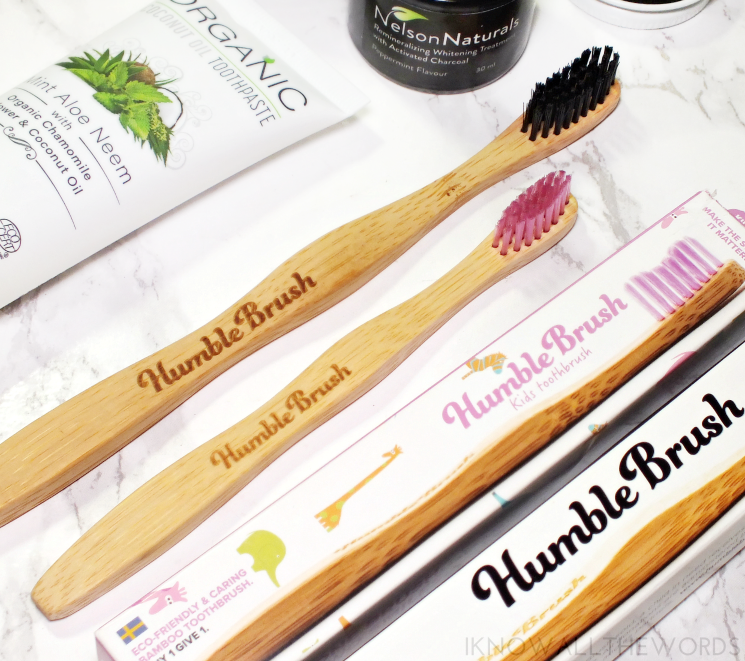 So, the brush itself is great, but Humble Brush as a company is even better: For every brush sold, a toothbrush is given to a child in need through the Humble brush Smile Foundation. The foundation has projects around the globe that deliver comprehensive and preventative oral care to those who need it most. You may know that I LOVE well.ca. So much... I order a LOT, mainly because I am always finding new brands and products I just can't not try. 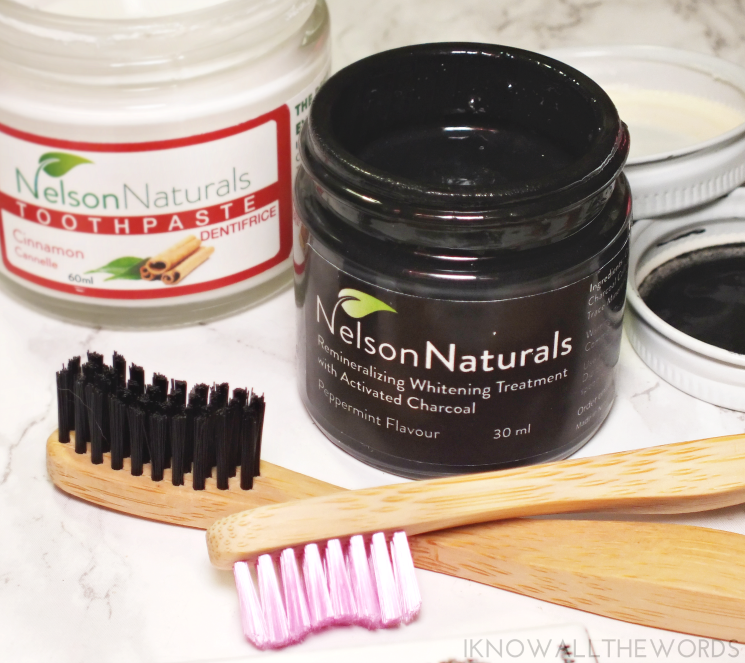 Bad grammar aside, I recently discovered the BC Based Nelson Naturals (based in Nelson, BC of all places) and their range or all natural, organic toothpastes. Xylitol: Used for its dental benefits and natural sweetness. Though xylitol can be derived from corn,Nelson Naturals only use xylitol that has been derived from North American grown birch trees. Xylitol helps to restore a proper pH balance to the mouth which creates an environment that is inhospitable to unwanted bacteria that lead to many dental problems, such as tooth decay and gum disease. Castile Soap: Yup, the stuff a lot of use to wash our makeup brushes... It helps create a familiar foaming action that enhances the overall cleaning properties of the toothpaste. Nelson Naturals uses organic and fair trade soaps. Natural Flavoring: All of their toothpaste is flavored by 100% pure, natural extracts. Trace minerals: used to enhance the remineralizing effect of their toothpaste. The other ingredients in this toothpaste create an environment in the mouth which allows the teeth to make use of these trace minerals. Colloidal Silver: Considered by experts to be the best natural antibiotic discovered, Nelson Naturals produces colloidal silver to enhance the natural benefits of their toothpaste. Not only does colloidal silver combat against harmful bacteria and pathogens in the mouth, but it also aids in healing to lower the risk of bacteria entering the bloodstream orally. Sea Salt: Sea salt has been used in the field of oral hygiene for thousands of years and modern science reaffirms its role as an anti-bacterial agent which helps prevent gingivitis, bad breath, and even eases pain while aiding healing. Okay, this can be a bit messy (keep your mouth closed!) 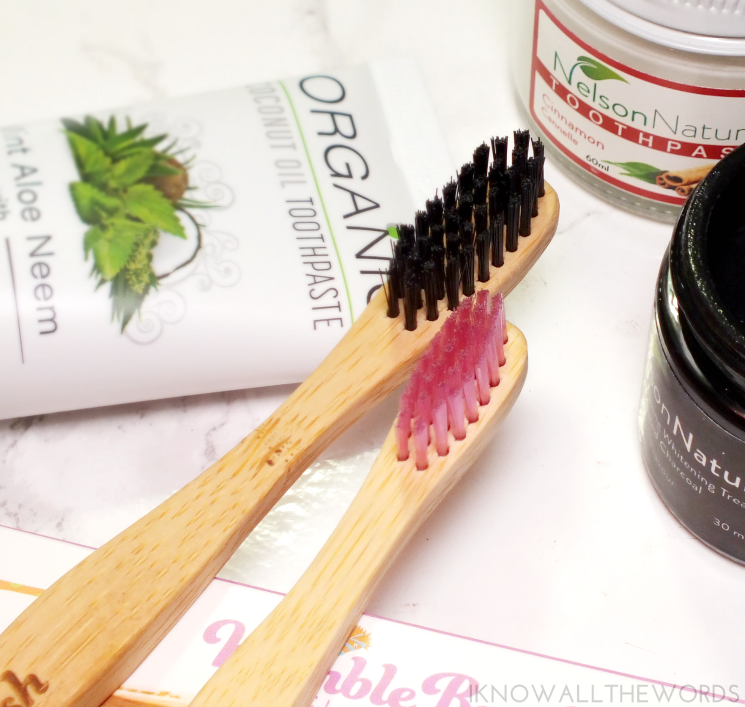 and can stain your toothbrush (the black Humble Brush is a great option for this toothpaste) but I love how clean this leaves teeth feeling and I have noticed some whitening with continued use. The downside that may throw some users with both the cinnamon and charcoal toothpaste is the salty / baking soda taste. Mint and cinnamon are dominant, but other ingredients do play a part in the overall flavour. 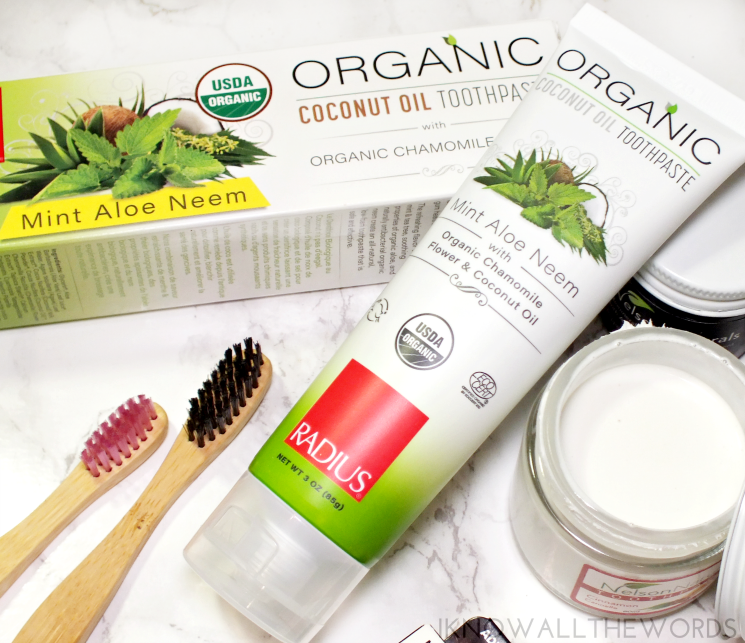 If a more traditional style (and tasting) toothpaste is more you thing, then the Radius Coconut Oil Mint Aloe Neem Toothpaste is worth trying. The gmo, chemical, and foaming-agent free formula is organic and coconut oil based. It uses natural mint and tea tree as the flavour (although, I can't say I taste tea tree.) It also utilizes organic aloe and naturally antibacterial organic neem to cleanse the mouth and gums leaving them fresh and quite clean feeling. 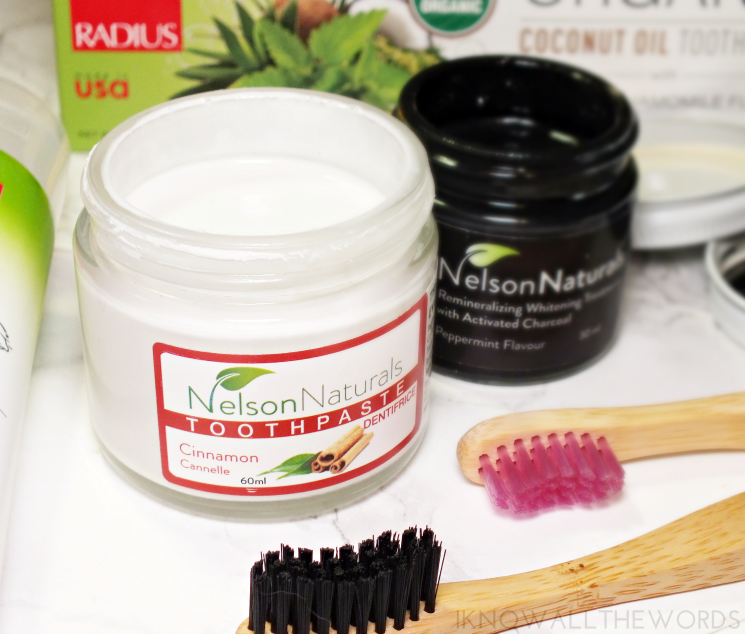 I love the idea of a coconut based formula as daily use of this toothpaste acts much the same as oil pulling can and works to detoxify while also improving gum health, healthy bacteria levels, and can whiten teeth. A Ginger Citrus flavour and Coconut Banana option (for the kiddos) is also available making this a great option for the whole family. 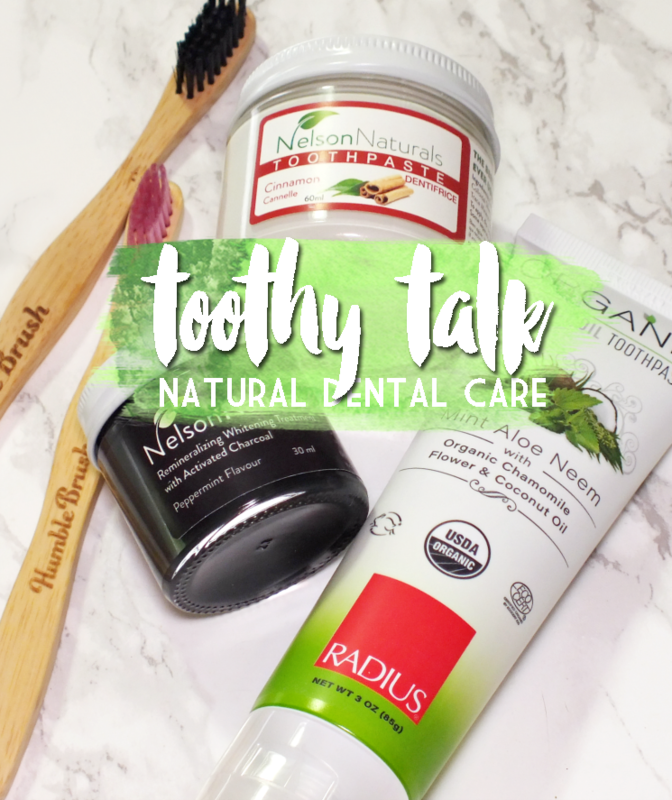 Overall, some natural dental care products I've really enjoyed testing. I know not everyone nerds out about their toothpaste, but when you figure you're brushing your teeth twice a day for pretty much your entire life, it only makes sense to know what you're putting in your mouth. What do you think? Do you use any natural-based dental products in your routine? Would you make a switch?